Yup, just like any other town in a place called the Weird West. I’ve been reading comics for as long as I could read, and I started picking up on fantasy and science fiction novels not too long after that. I still love ‘em, but every now and then a genre starts to get a little stale and you have to find something new to turn things over. These days, fantasy has branched off into sub-genres, and now we have private eye wizards lurking around in Chicago (Or do we, Jim? It’s been a while now…), and strange things afoot at the Circle K.
A while back, well before either wizard named Harry made his debut, DC threw a twist into the Western genre when they put out a bizarre title featuring everyone’s favorite scarred gunslinger, Jonah Hex. 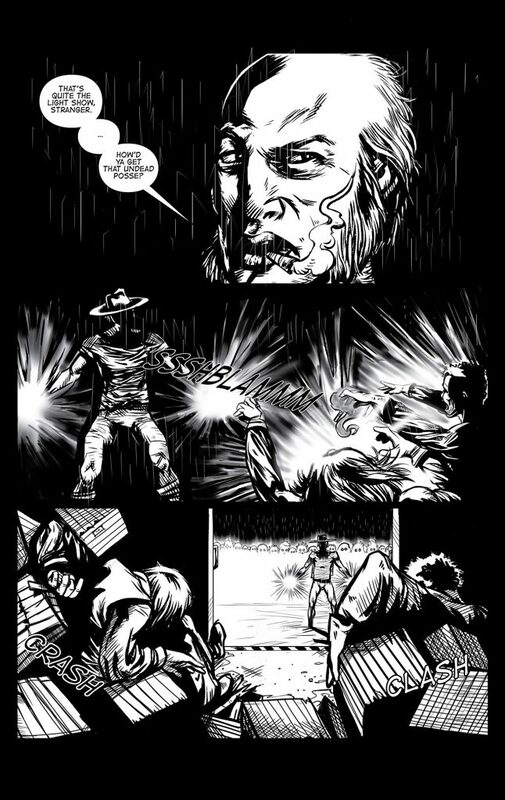 The “weird western” comic was born! Since then, titles like The Sixth Gun and Western Noir have brought elements of the supernatural into the “thrilling days of yesteryear”. It’s like a refresh button for my reading material, because no matter what else I have in front of me, these strange stories bring it all to a stop and pull me in. 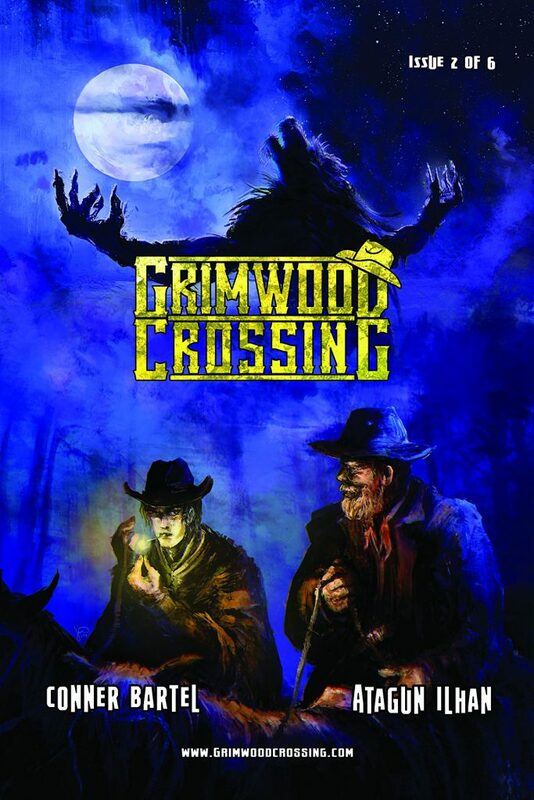 Far from just a horror story set in a dusty Western town, Grimwood Crossing has been populated by some pretty well fleshed out characters. 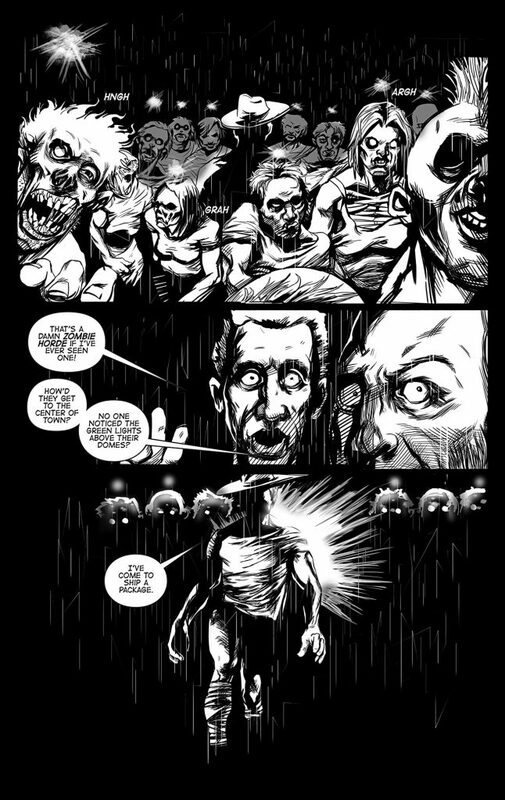 Where some might think “evil warlock… done, I’m in!” Conner Bartel has gone a little bit deeper and given the bad guy something to be legitimately pissed off about (not just that his name is “Randy”, although that could be enough to put any self-respecting warlock off his nut). Still, Bartel honors his chosen genre by expanding on, but not ignoring, the iconic archetypes often found within: the bucolic but wise and weary Sheriff; his semi-voluntarily, somewhat reformed bandit turned deputy who’s sharp as nails and quick to act; the keeper of the general store whose wares may not be totally on the up & up and is slow to make good on his tab at the tavern; the good-natured barkeep who’s quick with a smile or to light up your smoke (but there’s someplace that he’d rather be). All are present and accounted for, but then Bartel gives them a little bit more even when it isn’t really needed (that’s the great thing about archetypes, they’re there to serve a purpose but they don’t have to be limited to their surface quirks or behaviors). Paradoxically, going that “extra mile” might be where the story slows down a bit for my preference. At times, there seemed to be a lot of exposition for my taste. I always appreciate a story where a little less dialogue lets the story tell itself through its action, but despite my personal hang ups this was a great read. 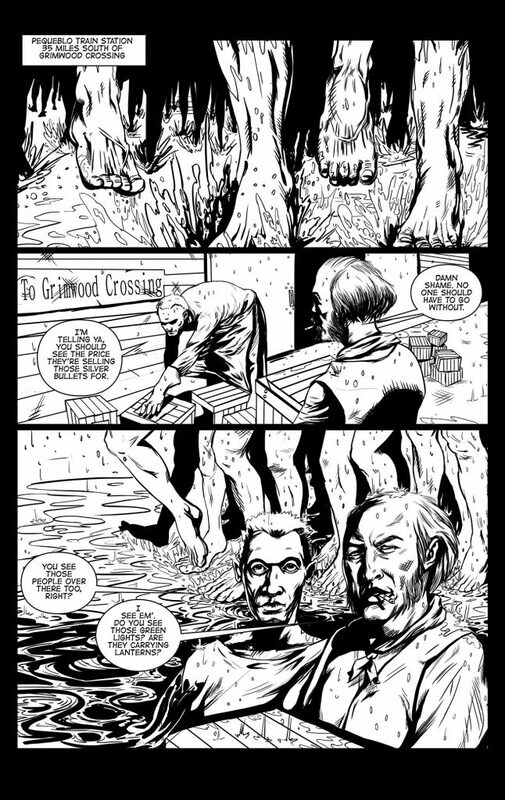 Illustrating Grimwood Crossing must have been a challenge artistically, given the Western and supernatural elements to be worked in. In that regard, Atagun Ilhan was on target. 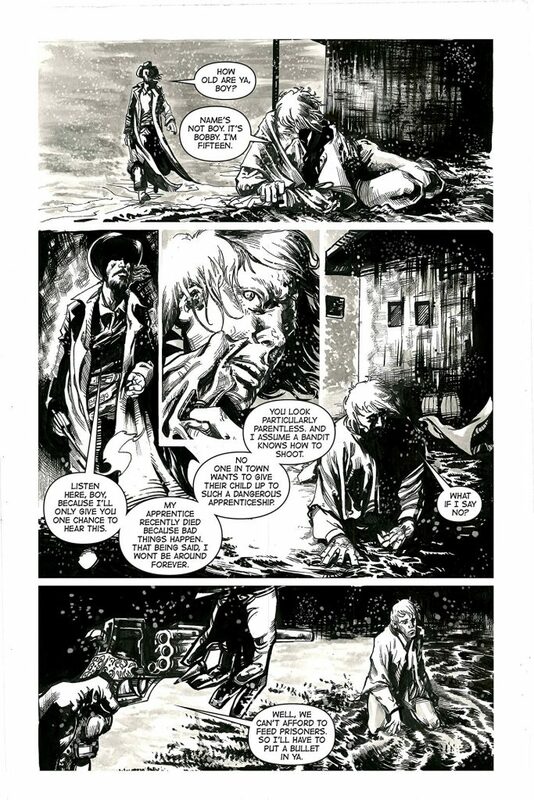 Ilhan’s seems to be one of those very detail oriented artists, leaving no dead space in the panel and eking every bit of line work he can muster onto the page. It all works out very well with the rustic setting, even in those cases where a little bit less could have served as well. 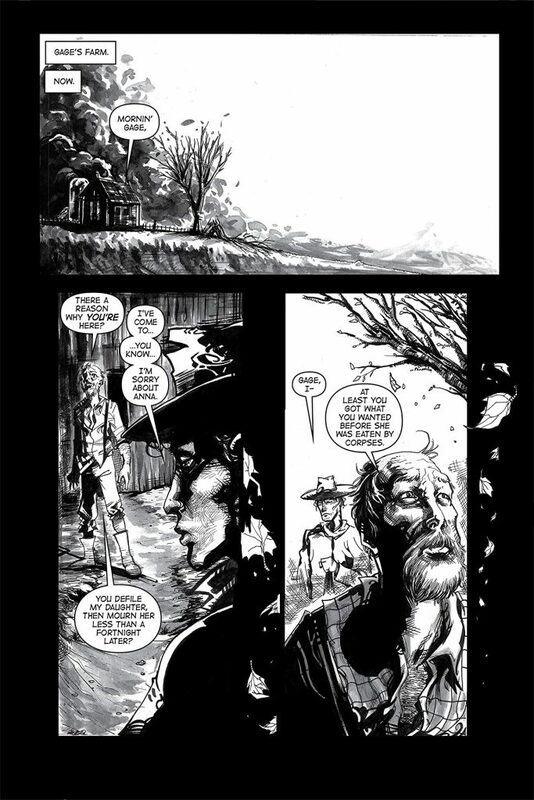 Grimwood is a black and white book, and every now and then the bigger picture can get lost in the minute details when there isn’t color and shading to help move a reader’s eye along. 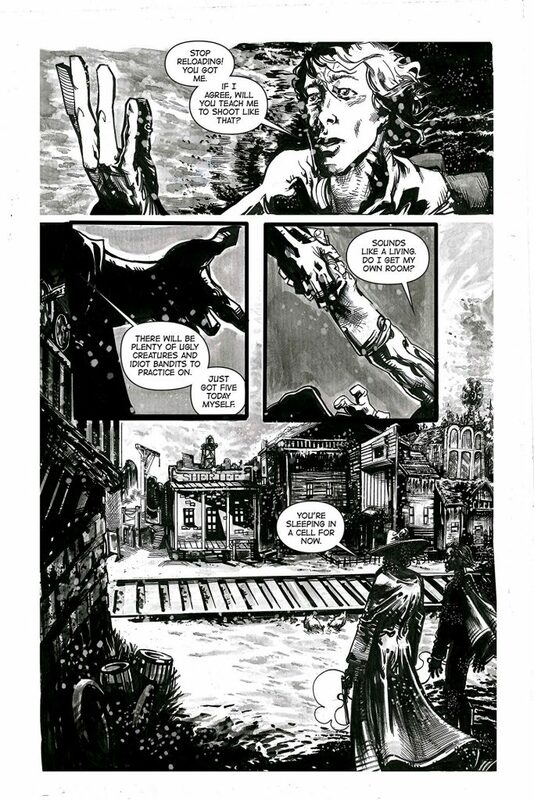 Still, there’s no denying that Ilhan’s style is very well suited to the tone of this story, as he has a little bit of Bernie Wrightson’s flair for the macabre. There’s generally no doubting who’s evil and who isn’t when you’re reading this book, and the characters are all distinct with a very few moments where I had to flip back a page or two to see who was involved in a scene- that alone is an impressive feat of illustration in a black and white with this many noteworthy characters. 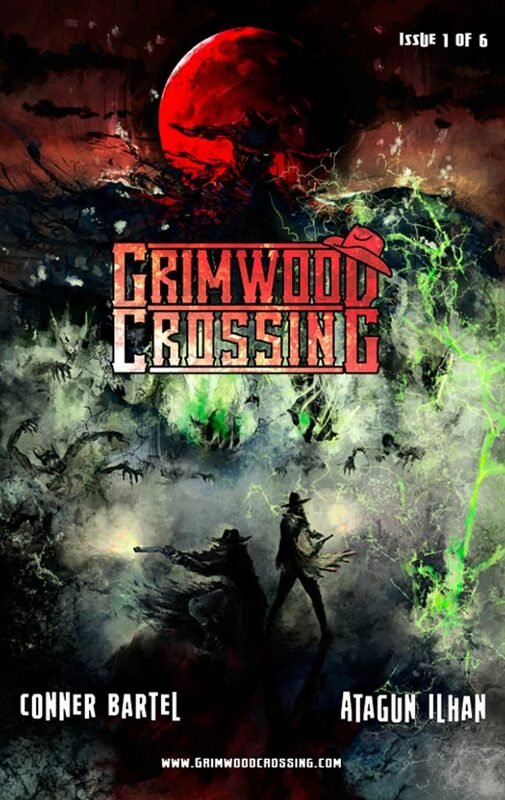 Fans of dark horror, urban fantasy, western action, or character driven stories in general, should have no trouble finding something to like in Grimwood Crossing. I’d be interested to see if Conner Bartel has any more story to play out in his dark little world. As it stands, this is a worthy successor to the relatively few entries among the Weird West entries found on my bookshelf.